In addition to examining the actions parents take to monitor their teen’s internet and cellphone use, Pew Research Center also asked parents how often they talk with their teen about appropriate and inappropriate behavior in various spaces, from what they share and view online to how they treat others online or conduct themselves in their everyday lives. When it comes to guiding their teen about making the right decisions, parents discuss “real life” behaviors somewhat more often than online behavior. Virtually all parents – 98% – report ever speaking with their teen about what is appropriate or inappropriate conduct in school, at home and in their social lives, with 56% saying they have these conversations frequently. Similarly, nearly all parents say they talk with their teen about appropriate behavior in various online platforms. For example, 94% of parents say they ever talk with their teen about what they should share online, while 92% say they talk with their teen about what constitutes appropriate online behavior towards others. At the same time, discussions about appropriate online behavior tend to occur with somewhat less frequency than discussions of how to behave at home or in school. Four-in-ten parents frequently communicate with their teen about what they should share online; 39% frequently discuss the online content their teen views; 36% frequently discuss appropriate television, music, books, magazines or other media; while another 36% frequently talk with their teen about their online behavior towards others. Parents of younger teens are more likely than parents of older teens to speak with their child about appropriate and inappropriate behavior in a variety of online and offline spaces – and this is especially true when it comes to discussions about online and media content. Half (49%) of parents of 13- to 14-year-olds say they frequently talk with their teen about what types of online content are acceptable for them to view, compared with 32% of parents whose teens ages 15 to 17. Parents of younger teens are also significantly more likely to frequently talk with their child about what is appropriate to share online, types of media to consume and online behavior towards others. In general, mothers and fathers report taking similar steps to monitor their teen’s digital behavior. However, mothers tend to have more frequent conversations with their teen when it comes to outlining appropriate behavior – online as well as offline. Some 63% of mothers say they frequently talk with their teen about appropriate behavior in school, at home and in their social lives, while 48% of fathers say they frequently have these discussions. Mothers are also more likely than fathers to frequently discuss right and wrong behavior in a variety of online spaces and media environments. While there are relatively few differences based on income and educational attainment in terms of how parents oversee their teen’s online and mobile behavior, parents that are less affluent and have lower levels of educational attainment are more likely to speak regularly with their teen about the do’s and don’ts of both the online and offline world. Among parents whose annual household income is less than $30,000, nearly two-thirds (63%) report frequently speaking with their teen about the right and wrong way to behave in school, at home and in their social lives. This is the same share as those living in households earning $30,000-74,999 yearly. In contrast, 49% of parents in households earning $75,000 or more per year frequently discuss this issue with their child. Similar differences can be seen when it comes to conversations about what teens share and view online, the media they consume and how they treat others online. In addition, parents who have not attended college are more likely than those with a bachelor’s or advanced degree to frequently talk with their teen about their online and offline activities. The biggest gap relates to appropriate online content, as some 47% of parents with a high school diploma or less say they frequently speak with their teen about the type of online content they view (compared with 34% of those with at least a college degree). Parents with less formal education are also more likely than those with a bachelor’s degree or more to say they frequently speak with their teen about what is appropriate to share online (44% vs. 35%), appropriate traditional media content (41% vs. 35%), or their online behavior towards others (42% vs. 34%). Parental monitoring of teen’s online and mobile activities tends to vary little by race and ethnicity. There are differences, however, in how often parents of different racial and ethnic backgrounds engage in conversations about appropriate online and offline behavior. For instance, Hispanic parents are more likely than either white or black parents to frequently speak with their teen about appropriate online behavior towards others: 51% of Hispanics parents do this frequently, compared with 32% of both blacks and whites. Hispanics are also more likely than either white or black parents to frequently talk with their teen about appropriate media content, as well as appropriate content to view online. These findings are in line with a recent Common Sense Media report of American youth, which found that Hispanic adolescents were more likely than whites to report that their parents talk about when they can use media, how much media time they are allowed and how to be respectful and responsible on the web. Although this survey did not ask parents for specific reasons why they communicate with their teen about certain topics, minority teens tend to go online with greater frequency compared with whites, which may impact the frequency of parental discussions about online behavior. A 2015 Pew Research Center report found that 34% of black teens and 32% of Hispanic teens say they go online “almost constantly,” compared with 19% of white teens. Another Pew Research Center study from late 2015 found that Hispanic parents tend to worry more than white or black parents on a number of measures, including bullying. When parents need to reach their teen quickly, phone-based communication is the preferred method. About half (49%) of parents say they most often will use text messaging when they need to get in touch with their child quickly, while 41% most often call their child on the phone. By contrast, just 2% of parents most often message their child on social media when they want to get in touch quickly, while just 1% typically send an email. Some 8% of parents say they most often use another method to get a hold of their child quickly, other than the ones listed here. 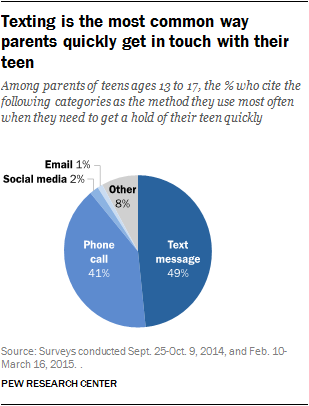 Among this 8%, many parents cited “in-person” communication as the most common way they get in touch with their teen. Parents across a range of demographic categories tend to reach for the phone when they need to get in touch with their teen, although higher-income parents are a bit more likely to use text messaging, rather than a voice call. Roughly half (51%) of lower income parents (those with an annual household income of less than $30,000) say they call their teen on the phone when they need to get in touch quickly, compared with 38% of parents whose household income is $75,000 or more a year. More affluent parents first send a text message when they need to speak with their teen – 57% say they do so, compared with 31% of lower income parents.